Limited stocks of the binder are available for immediate dispatch. Stock binders have 'In Memoriam' gold blocked to the face and will be dispatched with your choice of standard paper pack: (1) border only or (2) border and ruled. Binders can be customised to the face with text only gold blocking at a cost of £118.00 + VAT. Please note that customised binders may be subject to a lead time of 4-6 weeks. Note: This binder can be re-used multiple times, as we are able to offer a binding service (at additional cost) for the internal pages. We can fasten the loose papers into book format and "bind" them into a hard-back case. 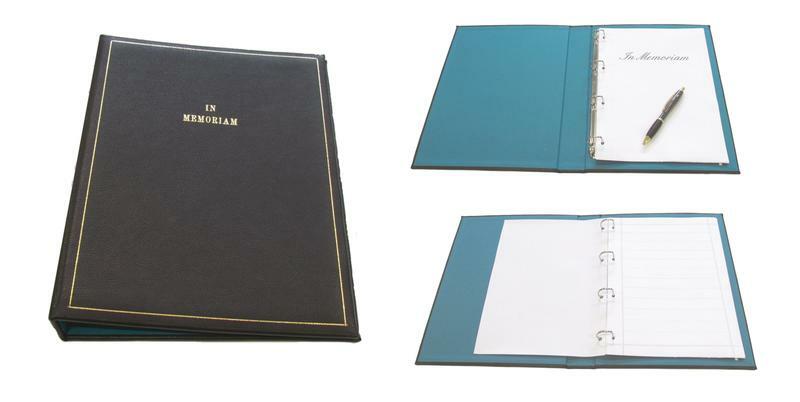 Prices for binding start from just £105.00 plus VAT for a single volume up to 40mm deep, full case-bound in leather-finish book cloth, including foil blocking on the face and/or spine. Simply re-order more paper packs to use the binder again.